» SPOT on Ops » You Can’t Wait Till The Last Minute To Improve You Operation – Planning Starts Now! You Can’t Wait Till The Last Minute To Improve You Operation – Planning Starts Now! Don’t let the lily pads take over the pond. The time to deal with the problem is now. I had the pleasure of recently attending an executive summit presented by ACS A Xerox Company in Hartford Connecticut. The conference theme was centered on insurance issues and looking forward to 2015. It was a great meeting with executives from a variety of insurance companies and industries. Looking to the future is a difficult task, especially when day-to-day issues make it hard to stop and be strategic. Unfortunately, trying to plan for the future takes time, and thinking it can be put off will only create larger problems. One morning a farmer observed that a lily pad had sprung up on his pond. The following day there were two lily pads, and on the third day there were four. Since they did not seem to be doing any harm he took no action. However, the number of lily pads continued to double every day until the pond was completely covered on the thirtieth day. James questioned the audience as to how long did it take for the pond to be covered 50%? Or even 25%? The answer was that the pond was 50% covered on the 29th day and 25% covered on the 28th day. His point? Managers and executives can’t wait until the 29th day to solve problems. With time slipping away, what should claims departments be thinking about in the next 5 years? That question, of course, will be answered differently from company to company. Regardless, there have been certain trends that exist today, being addressed by other industries, which should be looked at in today’s modern claims department. There is nothing too forward thinking about the concepts I address here. There are plenty of cases in the insurance industry where solutions have been adopted successfully. Nonetheless, if you have not addressed either of these because you felt it was not appropriate for your organization it may be time to reconsider and see how they may apply in the future. Social Media – I know it’s the buzzword in business wherever you go. You are probably aware of the powers of social media or you would likely not be reading this blog. Twitter, LinkedIn, Facebook and a variety of other services are being incorporated into businesses more and more each day. How will the insurance industry, and more specifically claims, adopt these outlets? Will you use Twitter to tweet claims alerts to customers? Are you creating a Facebook fan page to learn more about, and solve customer problems? How about an internal social network to share claims information amongst departments and partner organizations. How can these applications make your claims department more efficient? Mobile Technology – Everyone has a phone that can handle such an array of tasks that it’s amazing we ever functioned without them. Better bandwidth, and more coverage, allows access to an amazing amount of information from the palm of your hand. What is your company doing to adopt this technology? Are your claims adjusters able to assess claims on the road and instantly pass the information into systems for analysis? Are customers able to file a claim from their phone attaching photographs and other information like GPS locations? Will new devices, such as an iPad be used in the future claims organization? How will your organization respond to these devices? Lead or follow? Like most industries, adopting and changing with the times can be a difficult proposition. It takes time to think of issues, come up with solutions and implement the changes. Insurance companies have added legal, compliance and regulatory concerns, to say nothing of complex, and sometimes outdated, information technology systems. Regardless, it’s not too late to address issues to create a social media or mobile strategy. Think back five years and ask yourself how many lily pads would be on the pond had you stopped to deal with the first one on day one. The trends we see in technology, and in how people work around the world, are changing rapidly. To stay ahead of the curve, and take advantage of solutions that can help your organization, start thinking out-of-the-box now. Take a lesson from an article I wrote a few posts ago about changing hats outside your industry and see how others are adopting their operations to the changing times. Now is the time to consider change. 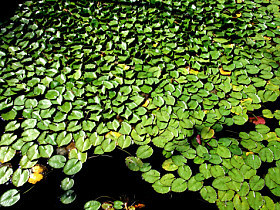 Before the pond gets too filled with lily pads attack the problem and look for solutions. Five years from now – you won’t be wondering what could have been. What kind of lily pad can you see on the pond that can be dealt with today? Tagged with Best Practices, Claims Technology, Claims Trends, Innovation, Management, Mobil Claims Technology, Social Media, Strategic Planning.